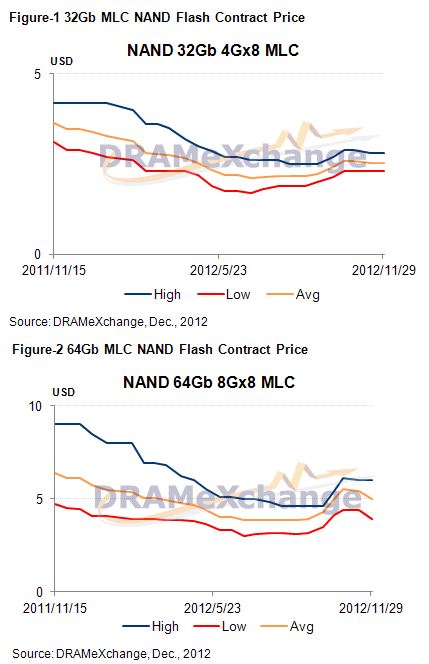 DRAMeXchange reports pricing of NAND flash memory chips continued to slide in November. Pricing of 32Gb MLC NAND flash memory chips dipped at a rate of 1-3 percent in the second half of November, while 64Gb MLC NAND chips saw a decline of around 7 percent. The firm anticipates NAND flash memory pricing will see a mild downtrend in Q1 2013, as the company predicts a slight oversupply in the market. According to DRAMeXchange, a research division of TrendForce, although NAND Flash manufacturers continue to use supply-restraint strategies as a means to stabilize prices, with the year-end replenishment demand from NAND Flash OEMs and channel market clients gradually declining after 2HNov, most mainstream NAND Flash average contract prices have continued to dip at a rate of 1-3%. In addition, following the increase of the 20nm 64Gb MLC shipments from some vendors, the 2HNov 64Gb MLC chip average prices have experienced a decline of approximately 7%. As most NAND Flash clients will decrease their inventory levels under the year-end settlement effects, replenishment demand for December has begun to experience a continuous decline. Taking into account the slightly increased proportion of wafer production and new 20nm-class products from some suppliers, along with the effects of the promotion strategies implemented by NAND Flash vendors, TrendForce predicts that for December, NAND Flash contract prices will continue on a downtrend. Despite the fact that only a few new smartphone models are expected to be released in 1Q13, and that some suppliers are employing production-cut or suspending capacity expansion strategies, the overall atmosphere toward the NAND Flash market demand remains conservative. As such, TrendForce projects that for the first quarter of next year, the NAND Flash market will experience a mild oversupply. NAND Flash contract prices, at the same time, are expected to exhibit a mild downtrend.